All photos Copyright © Cross Country Nurseries SMOKIN' ED'S CAROLINA REAPER® - super hot; Habanero Elongated; 2 to 3 inches long by 1 to 1.5 inches wide; medium thick flesh; matures from green to red; pendant pods; green leaves; 30 to 36 inches tall; Extremely Late Season (120+ days); Here it is, 2013 Guinness Book record holder for the world's hottest pepper, averaging 1.569 million on the Scoville Scale!! 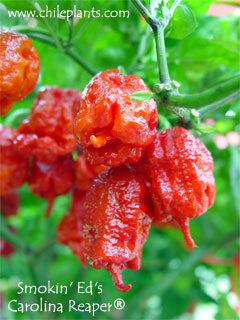 **Cross Country Nurseries is a licensed grower of Smokin' Ed's Carolina Reaper®. Smokin' Ed's Carolina Reaper® is trademark-protected. Pepper pods and/or seeds from these peppers cannot be legally sold to others. You must plan to use these peppers for your own use. ; C.chinense.